One of the challenges of RVR (Re-Volt Race) is the best 4 lap (or best 3 laps) section. 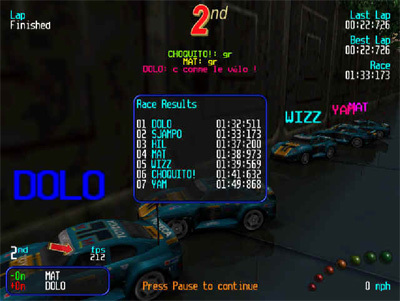 In this section, there is a ranking which is based on the best times of each player in the 13 stock tracks in a 3 or 4 lap race without picks with stock cars. How can you post a time? Make a screenshot of the result. A way to make screenshots is to download Gadwin Prinscreen or simply press F8 ingame. This will save the picture to your profile folder inside the Re-Volt installation. Enter the right track, lap count and choose the picture of that track and post it.